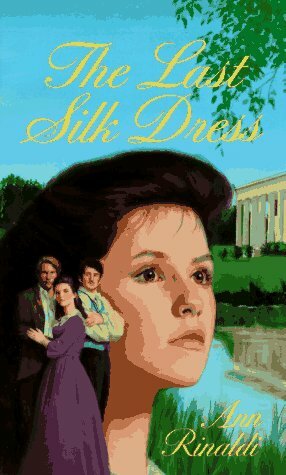 Amazon.com description: Product Description: High-spirited, beautiful Susan Chilmark, fourteen, vows to do something meaningful to support the Confederacy during the Civil War. Despite the wishes of her mother, Susan and her best friend, Connie, collect silk dresses from all of the ladies of Richmond to make a balloon that will be used to spy on the Yankees. But the issues behind the war aren't as obvious as Susan thinks. When she meets her dashing, scandalous older brother and discovers why he was banished from the family, Susan unlocks a Pandora's box of secrets that forces her to rethink and challenge the very system she was born into. Does she have the courage to do what is right even though it may hurt the ones she loves? With Neil Strauss | Reprint edition from Bantam Books (May 1, 1995); titled "Last Silk Dress"
from Holiday House (April 1, 1988); titled "Last Silk Dress"
from Demco Media (March 1, 1990); titled "Last Silk Dress"
from Turtleback Books (October 1, 1999); titled "Last Silk Dress"